Take your keys out of your purse or pocket and hand them to me. Your house is mine now. Whatever you did when you left home this morning is the very last memory you’ll have of it and everything you own. You probably locked the door behind you without a thought, certain you’d be back soon. Wrong. You’ll never see it again. Maybe I’ll take your car, too. That’s the best description I’ve heard of what it feels like to lose your home to a wildfire, as my wife Karen and I did in Sonoma County’s Tubbs Fire on October 9, 2017. Between midnight and dawn, tens of thousands of people lost their houses, neighborhoods and jobs. Forty-four people lost their lives (including four who died in a separate blaze in Yuba County). It’s disorienting. Confusing. Doesn’t seem quite real, even when you’re looking right at it. A neighborhood that had been there for 30 years suddenly wasn’t, like a bad magic trick. It took Karen and me a couple of months to get our feet under us — to stop waking up in the middle of the night ready to run, and start talking to architects, contractors, insurers, government agencies and others to figure out what to do next. We always knew we’d rebuild in the same spot. All the neighbors on our little street vowed to return, and we want to come back with them. But we’ve never built a house before, and certainly not in the middle of a major disaster zone. Our learning curve has been a cliff. Even after a year, we still hit new hurdles we have no idea how to jump. Karen and I are lucky. Like everyone we were underinsured, but we have some savings and are confident we can get a loan if we must. We’re healthy. We have computers and smart phones to tap online resources such as the many Facebook groups that formed after the fire. We get advice from friends who are architects, soil engineers and planners, and we found a good local builder who’s working fast. If all goes well, we’ll move in early next year. People who are poorer, less networked, or less lucky than us remain in desperate straits. Many gave up, took whatever settlement they could get, and moved to places with lower costs of living. I suspect the disaster will have subtler long-term impacts that won’t show up in the numbers or the news. I recently attended memorial services for two friends whose home was destroyed. Neither was well at the time of the fire—one had Alzheimer’s disease and the other was a 92-year-old with diabetes—but I’m certain that stress, grief and anxiety shortened both their lives. An undercurrent of melancholy hangs in the air months after the smoke cleared. Everybody knows someone affected. The world has moved on, as it should, but a lot of folks around here are stuck in a sad limbo. Karen and I are progressing but unsettled. Maybe we always will be. We’ve learned, but it’s hard to say what. We’ve changed, but it’s hard to say how. I think our family, including our adult daughters who took us in for a month after the fire, is closer. Nearly every day, Karen or I reach for an ordinary household item—a pitcher, a wrench, a soup pot—and realize we don’t have it anymore. Routine life is a constant reminder of our loss. Which isn’t to say our lives lack joy or gratitude. We’re not cheerless neurotics. We also live in a resilient community that can be astonishingly generous and kind. Most fire victims I know are getting along as best they can, building new lives that are different than their old ones. What else can we do? 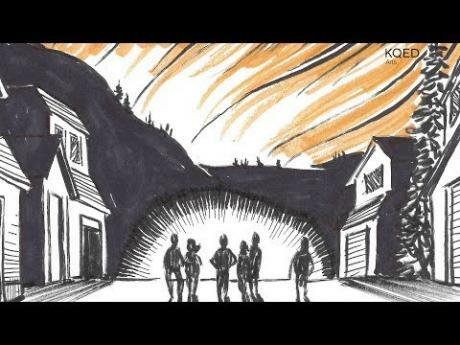 Brian Fies is a writer and cartoonist whose comic strip “A Fire Story,” describing his family’s escape from the Tubbs Fire, was seen by about 3 million people. An animated version of “A Fire Story” won a 2018 Emmy Award, and an expanded graphic novel of the story will be published in March 2019. His wife, Karen Fies, is the Director of the Sonoma County Human Services Department.